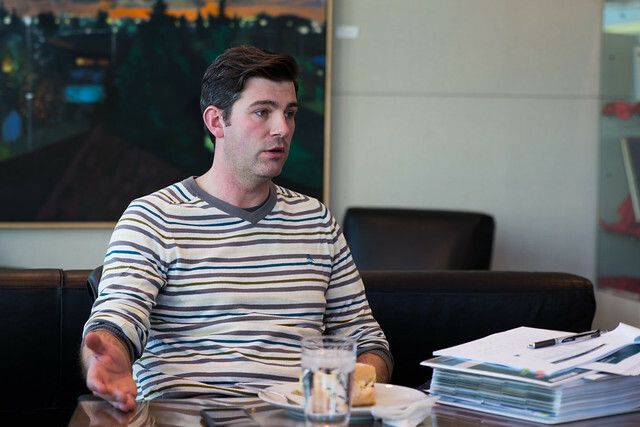 As he did last year, Mayor Don Iveson hosted a lunchtime “editorial board” for some local bloggers at City Hall last week. We covered a range of issues during the lunch hour, including his proposal to cut the 1.5% neighbourhood renewal levy, the need for affordable housing, the latest on the City Charter and his alignment with Calgary mayor Naheed Nenshi, and the ballooning Edmonton Police budget. It was suggested that public sentiment is that the City announces a high percentage tax increase and then Council works to bring it down throughout the budget process, looking like heroes in the process. Mayor Iveson rejected this notion. “It’s not a game, it’s us showing all the cards,” he said. The City is “the most transparent order of government” according to Mayor Iveson. “If decisions were made in private, there’d be no cynicism,” he continued. “But there’s no cure for cynicism like participation!” He called the entire budget process a “good example of local democracy” in action. He wanted to be clear that cutting the levy does not mean slowing down, however. “The discussion is just how to pay for it,” he said. So if we’re cutting the levy, where will the money come from? First, Mayor Iveson suggested that the tough economy means that costs for the work could actually come down. Second, he’s counting on transfers from the Province and the Feds. “I’m quite confident we will get predictable, sustainable transfers from the Feds starting next year, potentially closing in on nine figures in transfers to Edmonton,” he said. On top of that, the mayor said it’s “a reasonable assumption” that there will be a successor to MSI. That program is getting a $20 million bump next year, but its future beyond 2018 is uncertain. Mayor Iveson indicated the levy could be reviewed annually and brought back if necessary, though some of his Council colleagues have questioned whether it would really be that easy. We talked a little about affordable and social housing. “It sounds like there may be funding for affordable housing in the new Federal budget,” Mayor Iveson said. He told us the City is working to influence how that money will flow. “There’s lots of opportunities to redevelop old sites where the land is the most valuable asset,” he said. Building housing isn’t enough though. Mayor Iveson talked about the need for an ongoing funding source and said that could come from social enterprise. He mentioned the proposed Londonderry project and said that social housing with wraparound services could be very viable. “Cities are the places where creativity can occur,” he said. I’ve written in the past that I think the Edmonton Police Service budget has grown too large and needs to be reigned in. It seems that Council finally agrees, as on Friday they agreed to cap budget increases for the police to the rate of inflation plus population growth. Mayor Iveson blogged about his proposal today. Mayor Iveson didn’t give any indication he would introduce such a motion when we spoke on Wednesday, though he did say “it’s true that EPS has gotten almost everything they’ve asked for in the last eight or nine budgets.” He also suggested that the Edmonton Police Commission needs to play a role in scrutinizing the budget. Mostly though he defended police spending and suggested the Province needs to do more to help. The mayor said Edmonton’s police budget is perhaps larger than other cities because of demographics, the boom/bust cycle, and the number of prison spaces in the region. As with health care, demand for policing is growing faster than population, said Mayor Iveson. Mayor Iveson acknowledged that the timeline for the Charter that was agreed with former Premier Jim Prentice will not be met, but said that everyone is still committed to getting it done with this Council term (the next municipal election is October 2017). He noted that kind of timetable also aligns nicely with the proclamation of the new Municipal Government Act. Phase 1 has been about legislative changes. The goal is to have fewer restrictions on Edmonton and Calgary, and maybe over time that can trickle down to other municipalities like Red Deer. It’s really about the Province having trust in Edmonton and Caglary. Phase 3 would be about financial changes. The term used most often is “long-term sustainable funding” for the big cities. Council will continue discussing the budget right through December 10 if needed. You can dig into the budget here or you can check out the interactive budget simulator.